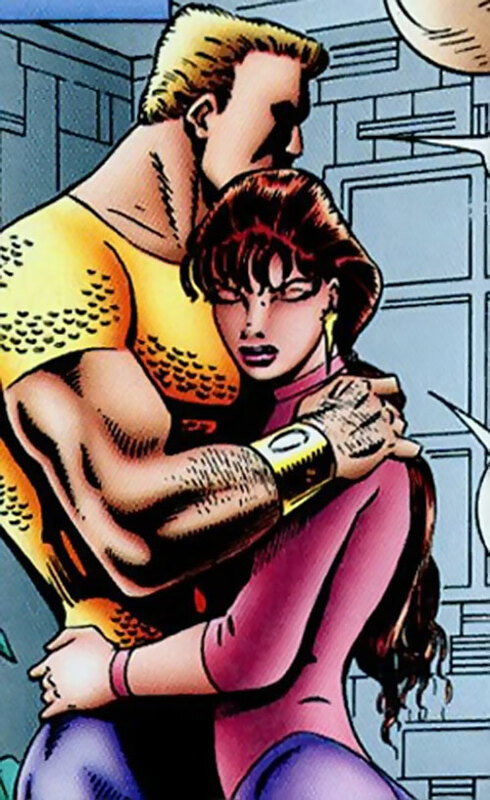 Starburst (Linda Warren) was a minor character in the Ultraverse comic book super-hero setting. 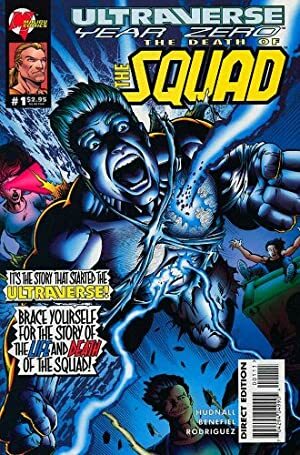 For context, people not familiar with the Ultraverse should first read our Hardcase character profile. She was the barely-seen-girlfriend-who-dies-to-motivate-the-male-hero type. That was back in 1993, and there were far fewer ways for readers exasperated with the trope to make their voice heard. But in a RPG context, it is possible to tell other, better stories about her. Starburst’s power is that she can fire powerful beams of force from her eyes (mostly) or hands (rarely). She has not other special ability, but is more courageous than usual. Linda Warren was running a New Age shop on the third street promenade in Santa Monica. She had her share of problems. The business was slow, to the point where the future of the store was in doubt. And her boyfriend Pete was a cokehead, to the point where she wanted to leave him. One day, while selling crystals, she experienced a strange sensation, and two wide beams of force erupted from her eyes. At first, she didn’t know what to do. But two other persons, Carlos Jimenez and Jamal Blass went public with similar abilities. Linda realized that her gift could make her wealthy. She also was afraid that if she didn’t go public the government might come after her to study her. So she staged a demonstration and made the 11 o’clock news. Shortly after, Tom Hawke went public and upstaged them all. Hawke called Warren, Jimenez and Blass. He convinced them to form the Squad. The Squad went to work as ultraheroes, hitting some street gangs hard. The team experienced success as well as having a taste of failure. The city, with which they worked most closely, organized with heavy support from the LAPD successful interventions against crack houses and in hostage situations. But most of the time, they did PR work. Their true test came with the LA riots after the Rodney King verdict . Although the city would rather have them stay put, they did everything they could to stop rioting and looting. The Squad was then at the height of its success. So hot, in fact, that the tabloids started running highly lurid stories about them. These included outrageous lies by Starburst’s ex). That was when NM-E, Rex Mundi’s eliminator of ultras, found them. The Squad was unaware that either Mundi or the extremely powerful NM-E existed. Thus, they were taken completely by surprise. Fifteen people present at Forsa’s housewarming party were dead before they could react. NM-E performed admirably. It clobbered Hardcase, put Starburst into a coma, impaled Forsa and sheared him in two, and gutted DJ Blast with chaingun fire. The dying DJ Blast, told Hardcase to jump clear while holding the comatose Starburst. Blass then detonated himself at the feet of NM-E, releasing all of his potential energy. This was enough to blow the creature — who later proved to be able to take Prime’s mightiest blows — to pieces. With the destruction of NM-E, the death of the Squad insured that the new generation of ultras could appear without being almost immediately destroyed by Mundi. The comatose Starburst, and Forsa’s corpse, were taken by agents from Aladdin, a shady governmental agency. The part of Starburst’s brain that commanded her superpowers was taken and implanted in another woman, who would become Choice. The still living parts of Forsa were also spliced into Choice’s brain. While this act gave Choice her powers, it violated the bodies of the heroes and probably ensured that Starburst would never wake up from her coma. Linda Warren is a nice, ordinary young woman. She’s not outspoken – especially in public. Linda is anxious, even a bit fearful. Although she’ll face actual danger with resolution, she often worries about potential trouble when making decisions. In private she was loving and tender, and left an indelible mark on Hardcase during their relationship. Goggles [BODY 02, Shade: 02]. Benefit 2 (Popularity), Equipment 1. Athletics 2 (+2), Close Combat: Unarmed 2 (+3), Insight 4 (+5), Perception 4 (+5), Persuasion 1 (+2), Ranged Combat: Energy blast 8 (+11), Vehicles 3 (+4, Limited to land vehicles -2). Doing Good Linda is brave and strives to be heroic. Limelight As a member of Ultra Force, Linda is constantly in the public eye, and her actions scrutinized. Identity Linda’s civilian identity is known. Uncertainty Linda in many ways is an ordinary and sometimes frightened person. At times, she loses initiative to all other characters because she hesitates. Trade-off areas. Attack/Effect PL 10, Dodge/Toughness PL 3, Parry/Toughness PL 3, Fort/Will PL 3. Points total 57. Abilities 12, Defences 9, Skills 12, Powers 19, Devices 0, Advantages 5. Equiv. PL 4.